With the NFL Draft and free agency having come and gone, we’ll break down all sorts of fantasy-relevant questions entering the 2018 season. Up next is a look at Kansas City’s new starting quarterback. It’s rare for a quarterback selected with a top-10 pick in the NFL Draft to sit behind a veteran for the majority of their rookie season these days. Fourteen of the 17 quarterbacks selected with top-10 picks have started at least 10 games as rookies, and two of the outliers were each surrounded by fairly unique circumstances: Jake Locker the epitome of a raw prospect having completed just 54% of collegiate pass attempts, and Jared Goff was caught up in the final year of the disastrous Jeff Fisher era. The third outlier, Patrick Mahomes, was drafted to a competitive and stable Kansas City Chiefs organization that had an entrenched starting quarterback in Alex Smith. Smith led the Chiefs to at least nine wins in each of his five seasons as their starter, but despite that and his career-best, near-MVP performance in 2017, he was swiftly traded to Washington in January, signaling the beginning of the Mahomes era. The Chiefs paid a steep price for this era to begin. In addition to essentially causing the Chiefs to let go of an established signal caller in Smith, Mahomes also cost the Chiefs two first-round picks and a third-rounder. But it’s easy to see why the organization is so enamored by Mahomes. With the division already locked up in Week 17 last season, Mahomes started against Denver and promptly topped Smith’s career-best marks in Mile High Stadium for passing yards (284 vs. 255), completion percentage (62.9% vs. 61.9%), and yards per attempt (8.1 vs. 6.6). While limitless arm strength and plus mobility can sometimes prove to be a curse for a young quarterback who doesn’t yet understand when it’s time to give up on a play, it’s still a major plus that the 6-foot-2, 225-pound Mahomes doesn’t lack any physical attributes and can make any throw on the field. Last season’s Chiefs defense struggled to stop anybody, ending the year ranked 30th in DVOA and allowing at least 24 points in six of their eight road games. They’ve effectively swapped two-time Marcus Peters and Darrelle Revis for Kendall Fuller and David Amerson, while also making ex-Cowboys linebacker Anthony Hitchens the league’s fourth-highest paid inside linebacker. Another below-average defense could prove troublesome in 2018 against a schedule that Warren Sharp tabs as the league’s fifth-toughest. Last season’s brutal unit already appeared to coax head coach Andy Reid back to his pass-happy ways, as the Chiefs ranked 17th in total pass attempts after finishing among the league’s bottom-eight offenses in 2014-2016. Tyreek Hill and Smith enjoyed the second-highest catch rate between a quarterback and wide receiver over the past 25 years among wideouts with at least 150 targets, and Hill’s respective status as the league’s No. 5 receiver in average separation (NFL Next-Gen Stats) and No. 6 receiver in yards per route run (Pro Football Focus) indicates that he should make life easy for Mahomes as well. Travis Kelce has been highly efficient when the ball comes his way, and he has ranked among the league’s top-five full-time tight ends in yards per route run for three consecutive seasons. Kareem Hunt became just the 15th rookie running back to rack up over 50 receptions in a season over the last 25 years. While slot man Albert Wilson has since been replaced with overqualified field-stretcher Sammy Watkins, the Chiefs figure to once again boast one of the NFL’s best groups of pass-catching options. The Watkins effect has been evident throughout his career, as he’s helped boost each of his quarterbacks’ average yards per attempt during their time together. Smith averaged 37.8 deep (20-plus yard) attempts per season from 2013 to 2016 before ranking 11th among all quarterbacks with 62 such attempts in 2017. 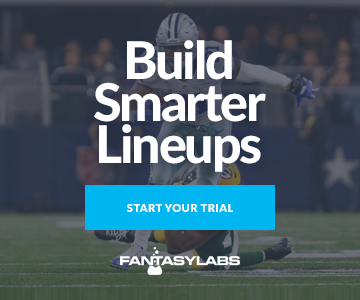 Mahomes has the right scheme and possesses the physical ability to produce consistent fantasy-friendly opportunities via deep passing attempts along with rushing attempts, and that combined with what’s likely to be a porous defense could lead to another top-10 fantasy performance by a Chiefs quarterback in 2018.